I offer my highest recommendation of Professor Vazquez ..."
" ... the session was amazing - jam-packed with invaluable information, clear, concise and informative, yet relaxed and engaging. I particularly appreciate the chronological listening examples of Afro-Cuban music, and your annotations for each piece. It was the perfect way to introduce the subject to the students .."
Chair, Winds, Brass and Percussion Dept. 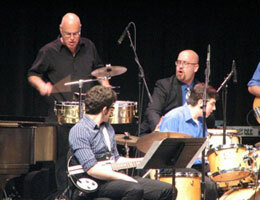 "He gave presentations about his music, delivered lectures about Afro-Latin music history and percussion, and performed with student ensembles and professional groups. 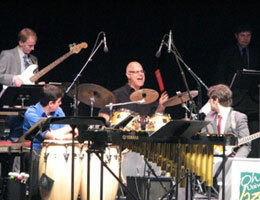 His visits to Ohio University were unforgettable events and they remain among the strongest artistic and educational experiences that any guest artist has presented to our campus and community ...."
After working as a band leader ("Urban Ensemble") and as a sideman during the mid & late '70's, Roland began teaching at Manhattan School of Music in '87. During his 10+ years as Jazz Faculty at MSM (also his MM alma mater), he taught mainly combos (focusing on student writing & arranging) - eventually starting the first MSM Latin Jazz Big Band in '98. 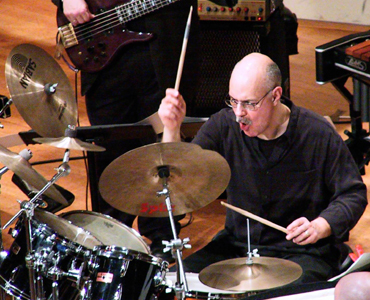 In 2000, he and his wife (composer/ performer Susan Botti) took positions at University of Michigan in Ann Arbor; where he developed a Jazz Composition sequence at the School of Music; taught combos; co-taught the Creative Arts Orchestra (an "improvisers" group); & established U of M's first Latin Jazz Ensemble. In '05-'06, he presented a course, "Intro to Afro Latin Music", at U of Michigan's Ethnic Studies/ American Culture wing, a 14 lecture course for "non-music majors" - organized around the evolution of musical forms within ethnic historical contexts. And of course, adjudicating student performances. It remains my goal for the students to positively experience the challenges of this music (big band, combo, and/or chamber works) - while being engaged & encouraged by the perspectives presented in my lecture presentations." The Independent Artist: I have been writing, producing, recording & performing as an "independent artist" since 1975. My experiences relative to the advantage & confines of major label contracts, working for major label artists - and as the primary executive of RVCD (est. 1991 / see iTunes, CD Baby) - are presented; and open for questions in this session. Ensemble Adjudication: When possible, I like to work with students on their own original material. All of my student groups at MSM & U of MI were expected to write for their ensembles. Of course, I welcome dialogue regarding ways I can best accommodate what I bring towards the benefit and interests of each individual programs.